There are many reasons that February brings visitors to New York City. Many come to enjoy the Lunar New Year celebrations, some have a romantic escape planned for Valentine's Day, and others, despite the often frigid days, are bringing their kids to explore the city because they are on school break. Although the weather makes it a little less comfortable for walking around, with proper planning and packing, you can still have a great time in New York City, despite the cold. Since it's cold and non-peak season in New York City, you can find bargains on accommodations and discount flights. Additionally, if you are traveling in early February, you can dine at some of New York City's best restaurants at a significant discount since you have a good chance of catching New York City Restaurant Week. Throughout the year, the cultural neighborhoods of New York City have tons of character and rich flavors—Chinatown, Koreatown, and Little Italy, to name a few. Chinatown erupts into a festive celebration for the Lunar New Year every year, as this date usually falls in February (though sometimes it's in January), and it brings with it a variety of parades and celebrations to experience. February is a bit warmer than January, but not by much. It is one of the coldest months, but it is also a little less likely to rain. Non-freezing days are possible, but people—especially kids—who are ill-prepared for wet, cold, snowy conditions will be miserable. The tall buildings can make the wind feel colder and stronger than usual, blocking most of the warmth and light of the sun, so be sure to dress for the weather. To keep your body warm, dress in layers. It will typically be warm in stores, subways, and attractions. But, since it is nearly impossible to visit New York City without spending time outside, pack warm, waterproof clothing, including sweaters, hoodies, a heavy jacket or coat, hat, earmuffs, scarf, gloves, and insulated waterproof boots. Warm feet make a world of difference when you're walking and exploring. Braving the cold in February is often worth it, as New York City celebrates the second month with some memorable events. Groundhogs across the country (most famously Punxsutawney Phil) emerge from their dwellings on February 2 and judge whether winter is waning or we have six more weeks to go. The Staten Island Zoo has its very own groundhogs and events to celebrate Groundhog Day. Ice skating in New York City is iconic. Whether you are skating under the Christmas tree at Rockefeller Center or amid the evergreens of Central Park's Wollman Rink, ice skating is often depicted on a picture-perfect New York City winter postcard. In February, Chinatown celebrates Chinese New Year, bringing out dragons, dancers, and the city's best Chinese food. This wild celebration shouldn't be missed. Twice a year, the city celebrates Restaurant Week, when some of New York's best restaurants offer discounted prix fixe meals. Winter fashion week takes place in February. While scoring a coveted invite to the hottest show can be tough to come by, you'll see plenty of action in the Meatpacking District. The Westminster Kennel Club Dog Show is held every February at Madison Square Garden. Dog lovers will love seeing the diverse breeds at this iconic venue. The main disadvantage of traveling to New York City in February is the weather. You can expect it will be cold. You may get snow. And, if you do get snow, the walkways and roads may be slippery and hazardous. When it is very snowy or slick, then you may have additional transportation challenges, such as canceled or delayed flights. 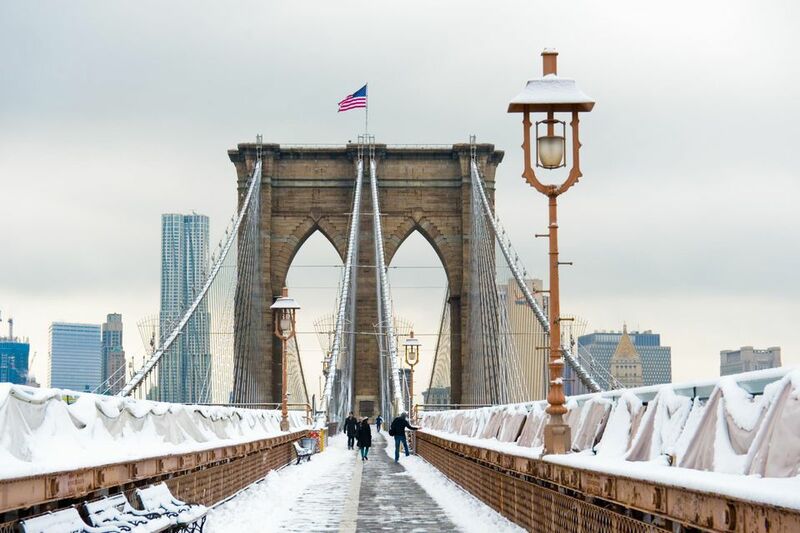 Although it is cold, New York City is always a favorite pick for Valentine's Day, so, do not be shocked if you have difficulty booking last-minute travel plans. Since most students have off for President's Day, there may be some inflated prices and crowds. President's Day falls on the third Monday in February. It is is a federal holiday to commemorate the birthdays of George Washington and Abraham Lincoln, and many businesses are closed this Monday, but typically restaurants and other tourist attractions remain open. Also, many American school systems have a week of vacation in February, usually the week of President's Day, so New York City school children may be out of school, and many families may choose to plan a vacation in New York City that week. When the February chill is too much to take, head inside. There are tons of museums and galleries to visit in Manhattan, including the two behemoths alongside Central Park, the Metropolitan Museum of Art and the Museum of Natural History. New York City is the place for shopping. You can hopscotch along the shops of Fifth Avenue, or stay entirely indoors and peruse the high-end boutiques at the Oculus of the World Trade Center. Deciding when to visit New York City? Read our helpful month-by-month guides. How to Have Fun in NYC in March, Even When It's Raining!